Hope Springs Eternal and its Name is…Fred. Fred. In all his gangly, leafy glory. My treasured constant. The above photo captures all the joy, sadness, hope, rebirth, commitment and humor of the past 10 years of my life. The fact that Fred is strangely naked in his midsection is still a mystery, but he holds his head high, and that’s all that matters. I have learned a lot from Fred. Really. When the time came to move across the country, I packed up my car and let Fred ride shotgun, atop my bundles of bags and boxes. Upon arrival, in my new state, I began to unpack the car. When I opened the passenger side door, Fred came tumbling out and unceremoniously dropped on his head and dumped all his soil out. That was awful. More awful? He repeated his performance three more times on three subsequent moves. I could not seem to stop myself from having him tumble out onto his head. He had to ride shotgun, up top because I never wanted him to get crushed. You would think I’d have learned that it was impossible to kill this plant. Well, when you are not married, and people talk about their husbands or lifemates, or even their dogs, and ask me about my situation, I tell them proudly, “I have a houseplant.” I am half serious. But nowadays, I challenge anyone to go up against our 10+ years and lots of lost soil. 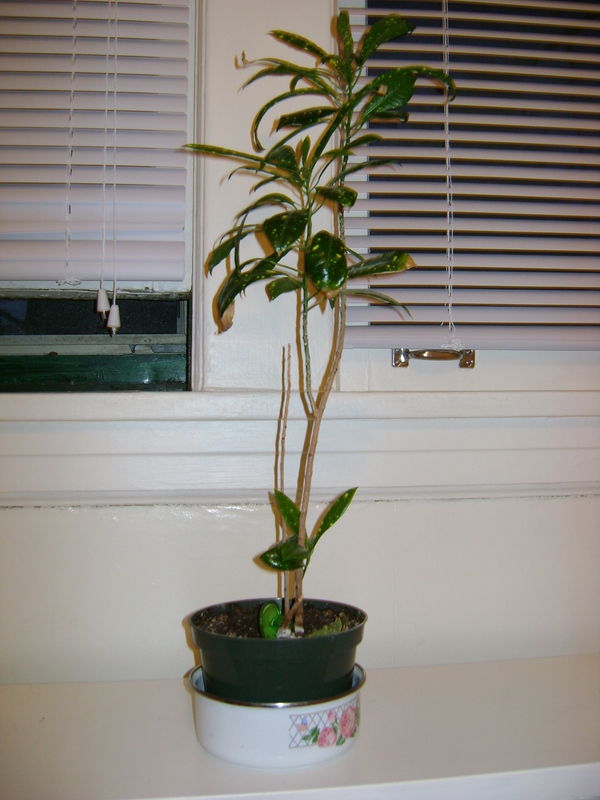 Oh, there were other incidents, such as the great “Soil/pot switch of ’09” where I tried to move him to a larger pot and new soil to which he responded by losing all but three of his leaves until I switched him back into his old pot. Boy he was stubborn. Then, I tried to give him bottled water with minerals. He didn’t like that either. Through the years, I have learned to deal with his quirks. I hope by now I have not totally lost all the people who started to read this post, because I am finally getting to my point. This not quite cute, not quite ugly plant has been the one constant in a life that has been lived in six different apartments since graduating college. This past weekend, I moved to a new home, to a new state in a new car, for a new job (same company), and Fred came with me. Of all my moves, this one was the most profound. On Friday, I walked away from the one place I thought I’d start a marriage in. It was the place I bought just one month after I was attacked and became a source of great worry and distress because of it. I spent hour upon hour locked up inside its walls, crying my eyes out through my worst fear about Italy. These experiences made it a place of no comfort and one I had to leave. But as symbolic as this move was/is because of the bad memories I left behind, I hated doing it because I could not take with me the paint my father and friends lovingly put on my home’s walls, or the design ideas I tried out after hours of scouring Domino and Better Homes and Gardens. Nor could I bring my loving, beautiful friends, my favorite coffee ladies Marina and Nikki, my favorite bar and bartenders at the Elysian Cafe, my favorite place to sit and watch the Saturday morning sun or the church I had come to call my own. But I could bring Fred. And in our relationship, while we share tenacity, durability and sticktoitiveness, I realized this weekend, when I placed him in his new spot in my new kitchen, of the two of us, Fred’s the only one that has ever truly put roots down, and figured out how to stay in one place despite some truly bad lows. You can learn a lot from a plant.